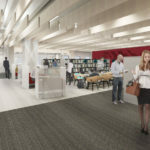 This project will design and remodel 34,700 GSF / 28,000 ASF across three floors of library, classroom, and computer lab space within the existing School of Business. The three-floor remodel will update the library to meet the needs of current students, faculty, staff, and the campus community; improve the functionality and visibility of the Business Learning Center (BLC); and add a technology-rich Special Projects Lab (SPL) within the first floor Huber Lab. Construction began in August 2017 with completion in spring of 2018. Structural Engr. Henneman Engineering, Inc.